When: Saturday, June 25 at 7:30 p.m. Some people are born with a silver spoon in their mouth. 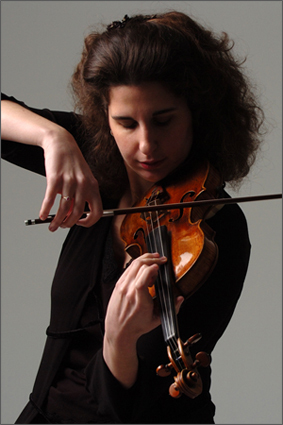 Laurence Kayaleh was born with a violin in her hand. After all, she is the daughter of Habib Kayaleh, the noted violin pedagogue who’s been running his elite Kayaleh Violin Academy in Crans-près-Céligny, near Geneva, Switzerland, since 1989, and with his pianist wife, Ingrid Hoogendorp, their Ecole supérieure de musique since 1973. « He taught me everything, » said Kayaleh of her father over the phone from her Montréal pad. Though her dad was her primary teacher, she also took master classes and played for the crème de la crème: Nathan Milstein, Igor Oistrakh, and Yehudi Menuhin among others. Not a bad upbringing. Career wise, she’s played around the globe, giving concerts in her native Switzerland, Europe, the U.S., Latin America, the Far East, Russia, and Canada. Kayaleh first came to Canada in 1999 to solo with the Montréal Symphony Orchestra under then-conductor Charles Dutoit. She’d been looking for a pied-à-terre in North America, and Montréal, with its Old World charm and French language, not to mention relative proximity to the U.S. (well, it’s closer to the Big Apple than Geneva is), fit her bill. A Canadian citizen for four years now, she’s been on the faculty at the Université de Montréal for the past two years, counting a dozen students in her studio. This Saturday, Kayaleh makes her Brott Festival début performing Beethoven’s Violin Concerto with the National Academy Orchestra in St. Christopher’s Church, Burlington. Scores of people have written cadenzas for this concerto’s three movements. However, none of them have the surname Beethoven. It seems that Beethoven either couldn’t have been bothered to write out the cadenzas, or more likely, simply left that to the improvisational skills of the soloist. So, at the concerto’s première in 1806, that challenge fell to Franz Clement, a violin virtuoso and sometime composer whose own violin concerto may well have been an influence on Beethoven’s essay. 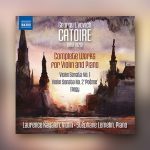 Over the years, composers from Camille Saint-Saëns to Ferruccio Busoni to Alfred Schnittke have had a go at putting the cadenzas to paper. And then there are the cadenzas by violinists such as Joseph Joachim, Henryk Wieniawski, Eugène Ysaÿe, Carl Flesch, Joseph Silverstein, and most recently, Rachel Barton Pine. As for Kayaleh, she’ll be doing Fritz Kreisler’s cadenzas, something she’s done whenever and wherever she’s performed the concerto. For the past 18 years, Kayaleh’s hands have held a 1742 Petrus Guarnerius. She owns the violin, after it was purchased for her by a now deceased Swiss maecenae. Kayaleh fondly recalls the day she tried out this Venetian violin in Geneva’s Tonhalle. The bill also includes Mendelssohn’s ‘Italian’ Symphony, Mercure’s Kaléidoscope, and Beethoven’s Creatures of Prometheus Overture.